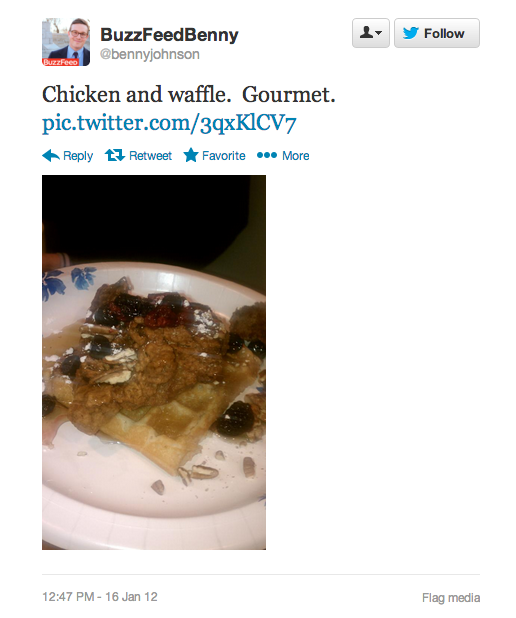 Benny Johnson needed to escape the Internet. In less than two years, he had built himself up into a Washington media-insider celebrity: one of the most trafficked news writers on one of the most trafficked Web sites in the world, BuzzFeed.com. He wrote light but irresistible stories that were more like lists: “9 Times American Politicians Tried to Look Normal and Failed”; “The 17 Most Canadian Things About Ted Cruz.” People began to recognize Benny from his Twitter avatar. They called him BuzzFeed Benny. Then he was exposed as a plagiarist. Forty-one of his articles were based on the work of other writers, unattributed. He lost his job and an identity that had opened doors and put him on guest lists all over Washington. His friends rescued him, he tells me. When the Twitter mob was crucifying him as the symbol of everything wrong with Internet journalism, they whisked him out of D.C., lured him onto a boat, and hit the open waters to hunt for crabs. They confiscated his phone, he says, and locked it in a safe to buffer him from the angry roar of social media. Less than a year later, Benny is back on the Internet, this time as a boss — a “content director,” for the conservative-leaning Web site IJReview.com. The Web site isn’t yet three years old and already has monthly traffic rivaling Fox News. Other disgraced journalists have found forgiveness too. But Benny rebounded unusually quickly, fielding offers within weeks of his dismissal from media organizations eager to get a piece of the addictive new breed of storytelling perfected by this 29-year-old. D.C. has always been the city of second chances; now it just moves at meme speed. And no one can ride a meme like Benny Johnson. “I have this incredible access, and all I’ve ever wanted was to bring people along,” Benny says. Benny wears his hair long on top and short on the side, a style made popular by the Seattle rapper Macklemore. Square-jawed, with eyes that dart back and forth under thick glasses, he looks like a skittish Clark Kent. He likes pipe tobacco, wearing suits patterned like American flags, and making fun of people for being hipsters. He grins so much, through criticism and compliments alike, that he can seem like the personification of the shruggie guy that started showing up in your Twitter feed last year. If you’re on a constant search for viral topics, it’s helpful not to know boundaries. Benny breezes uninvited into parties with the excitement of a puppy smelling bacon. He sidles up to strangers and starts a conversation like they’re old friends. Traditional journalists scoffed at his lists of photos and animated GIFs, but they’d kill for Benny’s reach. His explainer on President Obama’s push to bomb Syria was clicked on 860,000 times, helped by the funny reaction videos of MTV personalities Benny added to the text. (“The votes for military action are not looking like they will pass” was illustrated by reality star Lauren Conrad weeping a mascara-stained tear.) Almost a million readers — many of whom probably knew nothing about Syria — gave this “listicle” a click. But Benny isn’t content just sitting behind a computer. At the Supreme Court, he noticed the funny way interns sprint down the steps to carry a big ruling to their media bosses and turned that into a story. He found the secret Dunkin Donuts inside the Library of Congress. He assigned his team to parade a cardboard cutout of Hillary Clinton through a conservative conference to film the reaction of the rambunctious crowd. He doesn’t care if you think it’s dumb as long as you check it out. “A hate click is just as valuable as a love click,” he says. When Benny joined BuzzFeed in 2013, the site was trying to transcend its reputation for jokey pop-culture riffs and feel-good listicles (“13 Simple Steps to Get You Through a Rough Day”) by adding political reporters and narrative journalists. 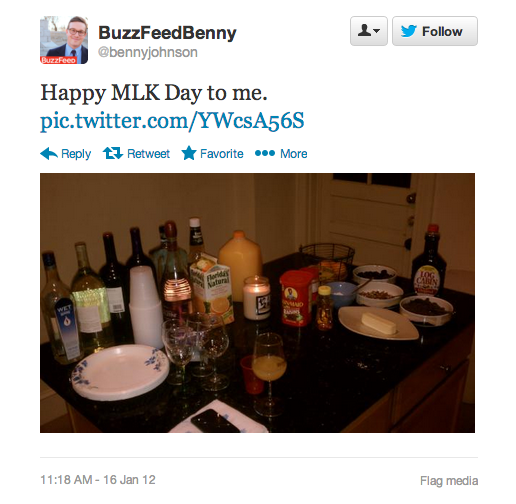 Benny straddled the two BuzzFeed identities. A University of Iowa chemistry major, he got into media not through the student newspaper but his activism as a campus Republican. After working in a German lab, he began contributing to the conservative Web site Breitbart.com in 2010 and adopted its firebrand tone. “Why not instead send the Imam to Pakistan where he can help shovel out drowning families, or to Somalia where he can persuade vicious Islamic Radicals to stop murdering in the name of his peaceful religion?” he wrote in an article decrying plans to build the “blasphemous Ground Zero Mega Mosque.” But Benny says now he was just trying to fit in. It paid off. Benny landed a full-time gig at Glenn Beck’s The Blaze in 2011. Soon he was mimicking the work of his favorite Web site: BuzzFeed. “I just loved everything they were doing,” he says. He started a correspondence with Ben Smith, the former New York Daily News and Politico journalist whom BuzzFeed hired to run a serious media enterprise, and talked himself into a job in 2013. He rose quickly, writing more than 500 posts in less than a year and a half, and racking up some major Web traffic hits with posts on political topics, a rare score for BuzzFeed. Even with the investment in serious reporting, recent reports suggest that little of its traffic comes from its news stories. Benny became a known quantity, a guy about town. He threw a July 4th barbecue where he served his guests shark meat, then paraded them over to the Capitol to crash a private party. His online persona had just as much swagger. He wasn’t afraid to pick a fight. “Repeat after me: Copying and pasting someone’s work is called ‘plagiarism,’” Benny tweeted last July, after seeing an IJR article about George H.W. Bush’s colorful socks that resembled one of his posts. Some found this a surprising charge. BuzzFeed had its own reputation for cribbing other people’s work. A post that got more than 15 million page views, “21 pictures that will restore your faith in humanity,” was widely criticized for being a clip job from Reddit and a site called Nedhardy.com. On a blog called Our Bad Media, Blippoblappo and another Twitter personality, @Crushingbort, named three examples of Benny’s work that cribbed from Wikipedia, Yahoo! Answers, and other sources. “It was so easy to spot this stuff, you have to conclude that there was essentially no editorial oversight,” they wrote in an e-mail to The Post. BuzzFeed brass did their own soul-searching and removed more than 4,000 old posts that they said no longer met their standards. Other than Benny, though, no one was fired. And so, Benny found himself out to sea. “Well, we weren’t on the boat the whole time,” Benny clarifies the next time he tells me the story of his getaway. His girlfriend had brought him out to Virginia’s Chincoteague Island, he says now, a place famous for its population of wild horses. She’s the one who locked the phone in the safe, he acknowledges in the retelling. They stayed in a condo. Friends came and went. Maybe not as epic as a soul-cleansing boat expedition with friends, but Benny’s ready with a new headline. “What could be more BuzzFeed than soothing your soul on an island filled with ponies?” he says. Within weeks of being fired, Benny landed a job at the National Review Online. A few months later, IJR — the same site that had copied his socks story — stole him away. IJR might not sound prestigious, but it’s a sleeping giant. The site gets about 20 million monthly visitors, according to recent searches on Quantcast, occasionally beating Fox News or the Drudge Report. The site was founded in 2012 by a former Republican staffer, Alex Skatell, who wagered there was a big audience whose political worldview was not being represented by viral news sites. Last year he had 10 staffers. This year he moved a team of 50 into a 9,000-square-foot office in Alexandria. So when they reached out to Benny with a pitch about wanting more original content, Benny didn’t just see a Web site that had once ripped him off. He saw conservative BuzzFeed. “I get to be the Ben Smith,” he says. Depending on how you look at it, Benny is either the problem with Internet media, or the solution. He is both the content monkey recycling old videos of the time Hillary Clinton did a Forrest Gump parody and the journalist driving to Baltimore to track down the business owner whose pizza shop was burned to the ground by protesters. Either way, IJR is right about something: This particular moment in Internet media is all about his brand of pithy, grabby, irreverent stuff. Even politicians are taking a page from this playbook, as they use the Web to bypass journalists and communicate directly with voters. When Obama was selling his health-care bill, he sat between two ferns for an interview with the comedian Zach Galifianakis. When House Speaker John Boehner was attacking the president’s free community college proposal, he used Taylor Swift GIFs. To Benny, this isn’t a sign of the decline of media. It’s an opportunity. Sometimes that creativity can get him a little carried away. Here’s Rieley’s version of the trip to Chincoteague: They spent the vacation alone, she says; there were no other friends. Nor was there much boating, though they did some crabbing from the dock. Rieley says she didn’t lock his phone in a safe; she simply powered it down and stowed it in her bag. As a journalist who has now fully investigated the story of the boat and the safe, I am inclined to believe her account. But I have to admit that his packaging of the anecdote is far more compelling.